Brownie chunks. Heath bar bits. Mini chocolate chips. Crushed peanut butter/regular Oreos. Pound cake. Chocolate Pudding. Cool Whip. Today is my birthday and while I'm always busy making everyone else birthday cakes, brownies, cookies, and what have you..I thought, why not make my own birthday treat? Well, here it is folks. Folks, meet Schlop...Schlop, Folks. Reacquaint yourselves; get to know one another. I assure you this won't be the last time you speak. This is a dish that I made up in college. It's super easy and can be no-bake if you choose so. My friends came up with the name "shlop" for lack of better names. 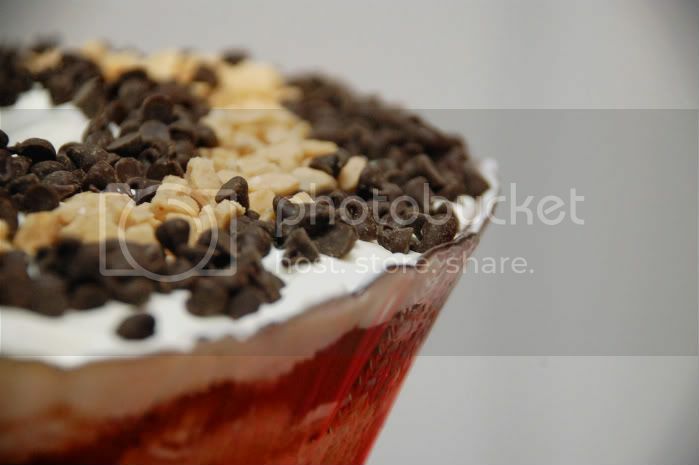 This is a pudding-like layered trifle featuring whatever kind of ingredients that appease you. In this case, I went ahead and baked brownies and pound cake to throw into this bowl of heaven. 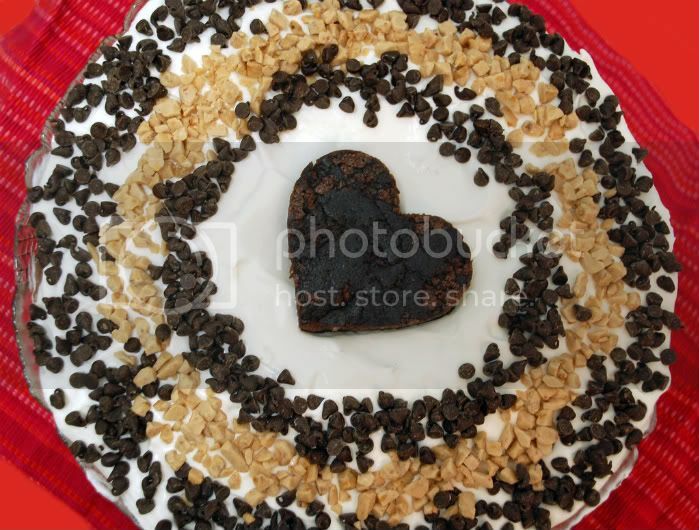 Once the brownies and pound cake were cooled I rolled them up into little balls/chunks and generously scattered them within the bowl plus a brownie heart on top for garnish. As for the pudding, Kozy Shack makes these great big tubs of chocolate pudding. I used Fat Free cool whip and other fix-ins for this chocolate decadence. Be forewarned, this stuff is super addicting. The consistency is such that the "shoveling" effect is quite prevalent. Ever heard of chocolate crack? This is it. Layer all ingredients until you reach the top of the bowl. Finish off with whipped cream. Keep refrigerated until serving. Wow, that sounds wonderful. Happy Birthday! Enjoy! HAPPY HAPPY HAPPY BIRTHDAY! Wishing you a great birthday and year!!! A very, very happy birthday to you, Melissa... may all your heart desires come true and the coming year bring you a little more money, wisdom and fun as well as a lot of health, happiness and love. Wow what a snack! The heart on top is so cute! Have a wonderful birthday :D.